Fun idea, I’d like to see the iterations. Doesn’t look like the type of shop where you’ll be ripping 16’ material. I assume you deploy the box and break stuff out to work in the yard/driveway then repack it ? Cool. So instead of unpacking you just unfold a side for its purpose. Yes, once you remove the need for anyone to walk into the unit, the whole box can be used for storage of tools and smaller supplies with access from the exterior. I would love to see some pictures if you have them. Can I ask why you no longer use the set-up? I've been wanting to do something similar. 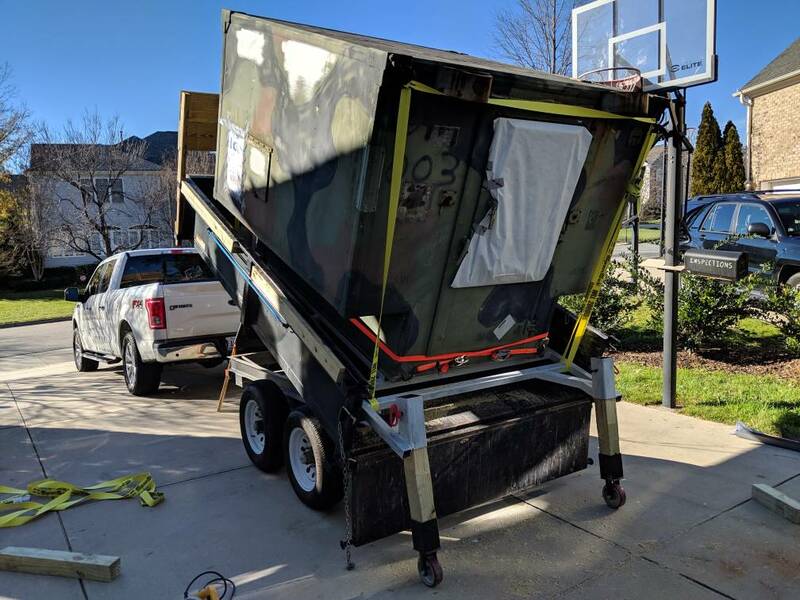 My idea (and I'm sure it''s not original) is to have a flatbed on the truck, a container built like a trailer for the tools, not really a shop but just to replace my trailer, then a dumpster bin that could be dropped and then loaded back up to take to the dump. One vehicle registration and three purpose built units. The only drawback I see to that set up is the fact that it's up so high or are you going to lay it right on the ground? Going up and down steps all the time would get old. And only one trip. I need to cut access doors and strip out the interior. I am going to make access through the sides. No need to get inside it. If you remove the need for a human to walk inside, you maximize storage. City= no go. Here in Raleigh NC, we are suburbs. This will give you an idea how secure these boxes are. any chance of a leg breaking and falling on someone? If it's military surplus, I'm betting it's heavy. 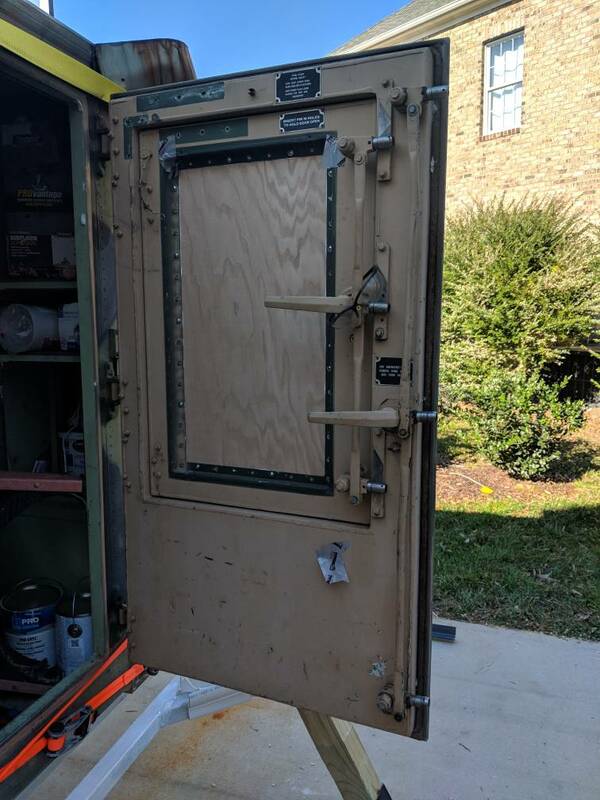 maybe installing large hatch doors on the sides with a sliding pin lock (seen them on some service truck bodies) will provide the security against thieves. looks like a cool project. would look great with your business logo on the finished sides for advertising. The box weighs 780lbs empty. I think that’s a really good idea. 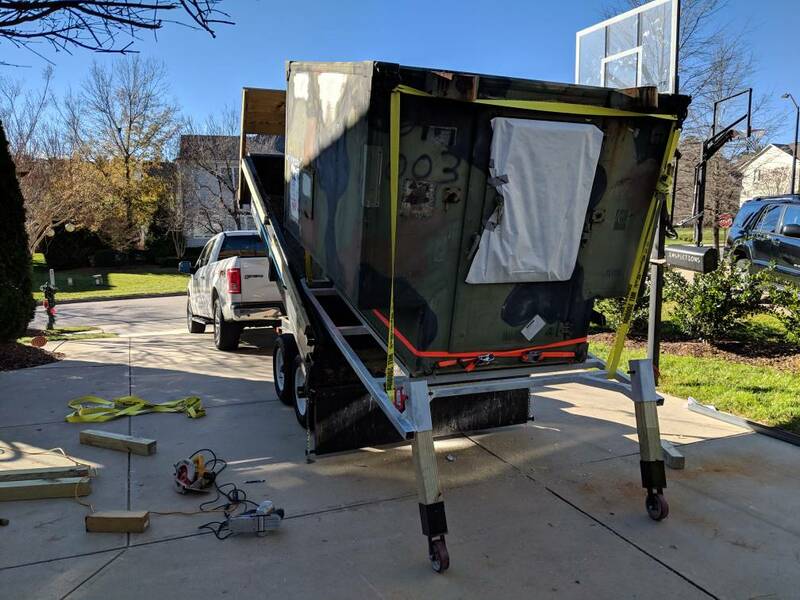 One of my biggest annoyances is dropping off the tool trailer and then making a round trip to pick up the dump A lot of wasted time. The first thing I don't really like are the 4" x 4" legs. That's just me though. I like the idea. Every once in a while I get a flyer about a truck show. On the front is a large truck with a utility bed. The bed gets dumped off, then you can pick up a dumpster. This is very similar to what you are thinking. I'm thinking something like this for loading and unloading. Wouldn't take much. You would only need a winch, which I assume you already have. I doubt you are dumping the box off, without some sort of winch to slow it down. I like the overall idea. Drop it off, then everything is there. 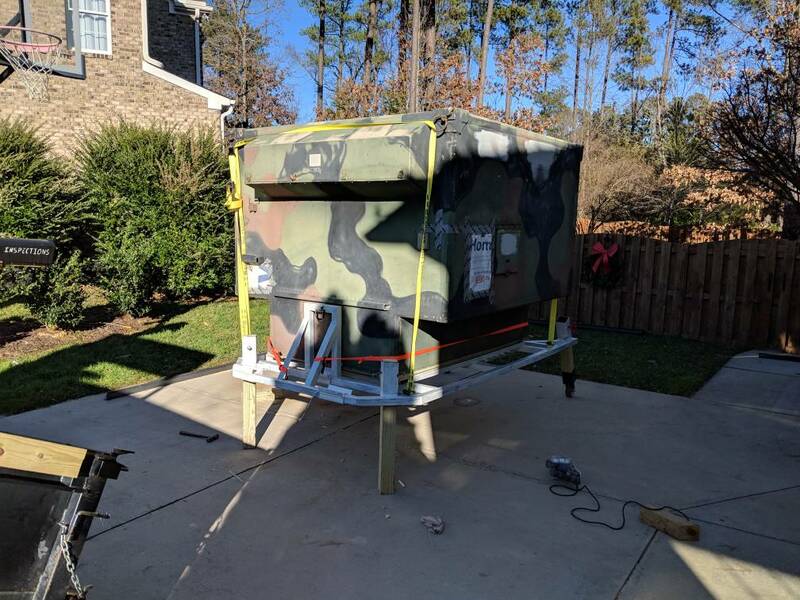 The same as leaving a trailer on the job site, but no one is going to steal it. Breaking into it, may still happen. The doors look like they have a good enough lock, but it probably relies on a padlock. Maybe not, I don't know. As long as you have room for a truck, a large tool box, and a trailer, on the job. Currently I'm trying to figure out the best way to go smaller, because I don't have enough room on my jobs.